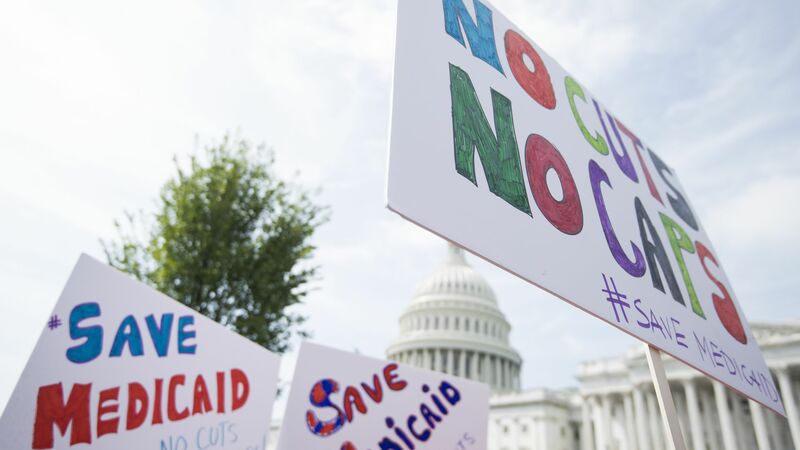 The Trump administration will have to clear some potentially difficult legal hurdles before it can fully implement the new Medicaid restrictions it announced yesterday. As soon as the Centers for Medicare & Medicaid Services actually approves a state’s proposed work requirements — which could happen any time — it will likely find itself in court. What to watch: Nick Bagley, a health law expert at the University of Michigan, told me CMS will have to defend these waivers on two fronts when it’s inevitably sued: It will have to argue that they advance Medicaid’s objectives, and that they’re legitimate policy experiments designed to test a hypothesis about the relationship between health and work. What they’re saying: CMS said it will be inclined to approve states’ work requirements through an existing waiver process designed to let states test out new strategies that might help improve the program. Federal law says CMS, in evaluating those waivers, should consider whether a program is “is likely to assist in promoting the objectives” of Medicaid. Work requirements don’t meet that standard, critics argue, because Medicaid’s stated objectives are to provide health care to low-income people, and making it harder for otherwise eligible people to obtain those benefits does not advance those objectives. In the 90s, California and the federal government relied on the same waiver authority to try to impose work requirements on certain welfare benefits. The 9th Circuit Court of Appeals blocked them, saying that a “simple benefits cut, which might save money, but has no research or experimental goal, would not satisfy” the law’s standards. Federal law “talks about an experimental pilot for demonstration programs. It doesn’t say you can revamp the program because you have a different policy preference,” Bagley said. The other side: CMS has a lot of flexibility to make its own determinations about what would further Medicaid’s objectives, and this waiver process had already grown into a pretty powerful lever to nudge Medicaid in one direction or another. “I think we made it clear we feel like this is within … the waiver authority,” CMS Administrator Seema Verma told reporters yesterday. Bagley says it’s definitely a winnable argument for the administration, if it makes its case well. Courts do tend to defer to executive-branch agencies’ expertise, and making a strong showing of some rigorous research interest would help a lot. CMS’ policy guidance included some citations to surveys and research indicating a correlation between work and health — a showing that will be critical to keeping this policy on sound legal footing. But The New York Times reports that some of that research is flimsy, and there’s plenty of competing data that points the other way. The bottom line: “HHS has a lot of flexibility here, and I could see a world in which work requirements are sustained,” but “the courts are going to ask hard questions,” Bagley said.